Right or wrong, I don’t spend too much time thinking about how to game Google. It was only during SMX that I realized I’ve learned more black hat tricks from conferences than anywhere else. With the recent Farmer/Panda Update, there was lots of talk around dubious practices: Link Farms, Like Farms (the new Link Farms), White Hat Cloaking (“The Klingons never showed up with good intent”), and more. However, the one that stood out for me most in this conference was an example given in the “Google Instant: 6 Months Later” session. One of Avi Wilenski’s clients found that their brand was getting tarnished by the negative search suggestions that were appearing in Google Suggest. Avi — who like many, couldn’t get through to anyone at Google to address the issue — took the matter into his own hands and crowdsource-spammed the results (since Suggest is based upon the most popular keyword-related searches). Spamming the search engine with positive searches effectively pushed the negative suggestions out of the suggest box. Needless to say, the Google rep sitting on the panel didn’t look very amused about this. Utilizing Promoted Videos — The equivalent of using PPC within YouTube, and can be linked to your Adwords account. Adding Caption Call-to-Actions within videos to take the viewer back to your site. The aimClear crew did a fab job sharing how to win on YouTube. More and more, I’m finding that a lot of the learnings I gain from conferences come not from the sessions themselves but from meeting and speaking with other attendees: geeking out, sharing ideas and experiences, not re-creating the wheel, and discovering time and again, that we tend to face very similar challenges. So remember to mingle, go to the after-hour events, and get social. 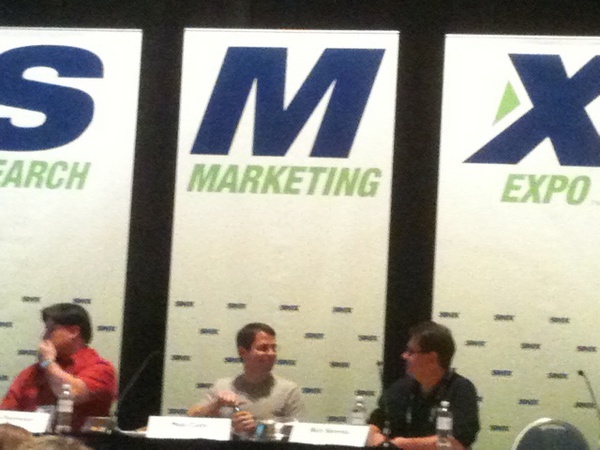 For the full low-down of the sessions, check out Search Engine Land’s SMX Blog Recap from the event.